On our way from Wellington to Nine Mile Canyon. Low clouds from the storm the previous day were clearing as we drove towards the Book Cliffs on Saturday afternoon. Welcome to Nine Mile Canyon. Low clouds in Nine Mile Canyon. Our first stop of the day was actually at a very nice pictograph panel that I have known about for years, but never made it to before. These are some of the nicest pictographs I have seen in Nine Mile Canyon. With temperatures in the 50’s and melting snow, it was a pretty muddy hike to get to this one, but well worth it. We made a quick stop at the petroglyph panels near Pig Rock. I made sure that Diane was able to see the Great Hunt Panel in Cottonwood Canyon. Then we walked down and across the road to the Big Buffalo. I love the sheep with the spiral tail in this one. As we were driving back from the Great Hunt Panel, I spotted these high up on the canyon wall. They were new to me. A little further down the road Diane stopped me because she spotted these faint pictographs featuring a black rainbow. We hiked and visited the panels around Daddy Canyon. Before leaving Nine Mile Canyon for the day we stopped at the impressive Owl Panel. Late afternoon light in the canyon on our drive back out. The moon was rising above the Book Cliffs has we drove back to town for the evening. On Sunday morning we met up with Dennis at the gas station in Wellington and headed back into Nine Mile Canyon to visit more new sites. While I have known Dennis for years, this was actually the first time we would be doing any hiking together (not counting an unexpected meeting in Range Creek a while back). We started the day by climbing up to this very interesting petroglyph that I have wanted to see for a while. There were plenty of other nice petroglyphs nearby, too. Later in the morning while driving down the road, Diane stopped me when she saw these Ute petroglyphs above. Neither Dennis or I had seen them before. Diane was on a roll today because she spotted these next two nice petroglyph panels. Both new ones to Dennis and I. This one was located very high up the cliff and we didn’t climb up to it, but I managed to get a decent shot with my long lens. Diane is looking forward to returning so we can climb up into this area and search for more. We also stopped to see the Coyote Panel that some believe depicts a Hopi creation myth of Coyote in the act of placing the stars. According to one Hopi creation myth, Old Spider Woman provides Coyote with with a sack filled with stars. After climbing to the top of a mountain he begins to distribute them neatly in the heavens, including creating the well-known constellations. Soon, he grows tired of this work and picks up the bag to throw its contents into the sky. This is the reason why many of the stars are not arranged in an orderly fashion. … and this slab with dots and lines. Dennis had heard about a very large petroglyph panel with four foot tall sheep that we went searching for. It was a steep and loose climb to reach them, but we did manage to find this impressive panel. I know it’s hard to tell scale from the photo, but these are the largest petroglyphs of sheep I have ever seen! The SWELL Jeep and Diane’s Ford Edge. We took Diane’s car this weekend since we didn’t need my Jeep for any place that we planned on going and it gets better fuel mileage, but we did get it pretty muddy inside and out. After finding the large bighorn sheep petroglyphs and climbing back down it was getting later in the afternoon and we still needed to drive home, so we parted ways with Dennis to leave for home. 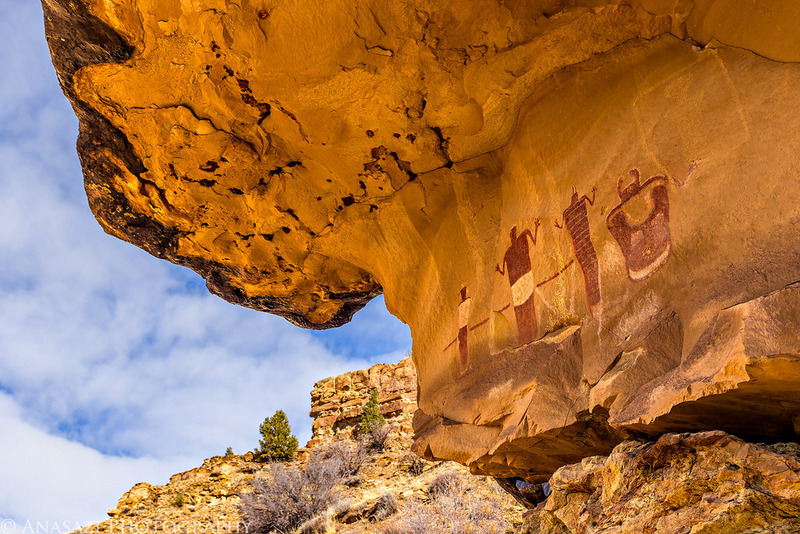 We had a nice weekend visiting some amazing rock art in Nine Mile Canyon and I want to thank Dennis for showing us around a little on Sunday. Wow. The first pictograph alcove shot (the one after the low clouds) looks like a symbolic representation of nuclear war and the demons it would unleash. Thanks again for the invite, Randy. I had a good time hiking with you and Diane, and the rock art that Diane spotted end up providing me with an entire day of hiking and discovering more rock art the following day. Awesome, can’t wait to see your photos of what else you found. By the way, check out page 219 in The Split Sky by Tom McCourt for a photo of that Ute panel we visited on Sunday. Inspirational! Gotta go back to Nine Mile Canyon!